Several generations of Thompson’s lived on Trigg Farm opposite the Pemberton Arms car park in Station Rd. Margaret’s grandparents Charlie and Annie lived in the farmhouse and some of their sons and daughters lived in a bungalow or railway carriage nearby on the farm land. The farmhouse was listed so they weren’t allowed to knock it down and couldn’t build another property in front of it (even though it was later knocked down by its new owner.) Margaret’s parents were Strict Baptists and went to a chapel in Cambridge. A coal pile separated the sheds from the railway carriage which was to the right, not far down the lane, before you came to the farmhouse. Margaret was born in the Railway Carriage and lived there through the war years until she was a teenager. The carriage was divided into two rooms, giving a double bedroom and a living room. Behind the carriage there was a gap before getting to the neighbours barn. 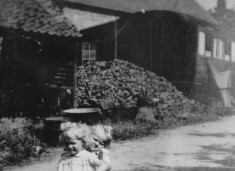 Margaret’s father built another small wooden addition to the carriage between it and the barn for Margaret and her sister Sylvia to sleep in. It was very tight and they had to sleep top to toe. They had a little range with oven, fuelled by coal, for cooking. This made it very hot in summer so Margaret’s dad put a tarpaulin over the gap between the carriage and the neighbour’s barn and they had table and chairs underneath, outdoors. There was no electricity in the railway carriage or in the farmhouse; they had oil lamps and candles. After Margaret’s grandfather died and her family moved into the farmhouse they added electricity. They had to get their water from Memorial Green fountain/tap which seemed a long way when they needed water for the laundry. There were two wells on the farm, one by the railway carriage that you pumped and the other nearer the farmhouse and sheds where you had to drop a bucket down. The pump on Memorial Green had a circle of iron railings round it and Margaret would walk, balancing, along the top as a child. 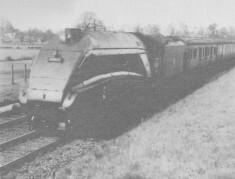 After Margaret’s family moved into the farmhouse her brother Ron (10 years older than her) moved into the railway carriages in 1952 with his wife. Ron was away in the army in wartime. 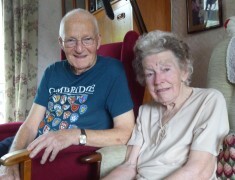 Margaret and Barnie stayed in the farmhouse from 1952-3 after they married before they got a house in Queen’s Close. 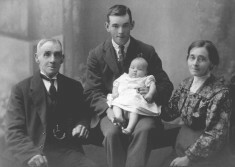 After Margaret’s dad Charles died, Ron and family moved into the farmhouse with his mother Lily. Lily later moved to live in Green Man Lane. Margaret’s grandfather’s brothe, George Thompson first lived in a bungalow behind Trigg farmhouse but then built a new bungalow on land by the poultry farm he owned on Station Rd (now No 53 and on the corner of Lawrance Lea). Margaret went to Harston school. There were three classrooms and a room by the clock that was the infants. They had desks for two pupils to share. Schooling was ok but not so interesting near the end when the headmaster George Royston would fall asleep. If no-one owned up to some misdeed they all got the cane. She remembers girls as well as boys getting the cane on their hands for picking walnuts. When a child, they had ration books for sweets during the war and she would get hers in 2-4oz weight at Miss Mumford’s Shop (where Hairs & Graces now is). During the war Margaret and friends collected Rose Hips which were used for syrup and conkers for use in ammunition. These they would take to the Bisseker’s Old House where they got a bit of money for them – which seemed a lot in those days. Margaret remembers soldiers who were billeted in the barn behind the railway carriage used to go to the Pemberton Arms for a drink. Margaret went straight from school to work in the canteen at Pest Control at Hauxton, peeling potatoes and lots of washing up. Both she and Barnie worked there for 37 years, Barnie in the engineering section. Margaret only took some time off when she had her children. Mr Ripper who started the firm first lived during the war at Sunbourn above the Station. He was Austrian. He later moved to the High St between the Old English gentleman and the garage, then moved to Hauxton in one of the big houses beyond the asparagus farm. There were glasshouses nearby on Station Rd opposite Hays Baggot Hall Farm and next to them were allotments where the school field now is. Bert Rayner used to work in the glasshouses, and later for Hays. They always went to the crossing gates at Harston Station when the Royals came through on the way to Sandringham. In the 1950s Barnie sold his bike and put it on the train for London to its new owners. They used the train quite a bit for getting around. They went by train on their honeymoon. Margaret’s Mum Lily used to pick vegetables and fruit and send them by train, in the guard’s van, for her sister who lived in Brighton. One day when Barnie and Margaret were looking for their missing dog, they were near the train station when they saw the Mallard go by which had the record for being the fastest train. It is now found in a museum in York. Fountain Cottage was opposite the War Memorial where there was a fountain, hence the name. Badcocks Bakers were in the next building. They made a lovely dough cake which Margaret’s family sometimes bought. This was about 6 inches round and was spiced with raisins in it. Barnie would sometimes buy one of these from Fitzbillies in Cambridge when on a work break. Next to Badcocks was the Post Office where an odds and ends shop was. Then there was Granary Cottages opposite the ditch alongside Harston House where the Greene family lived. Graham Greene the author visited there. Harston Green was where the Fair came with amusements on the grass and stalls on the grass in front of the three cottages (now ex-council houses). This still occurred while Margaret was young but later it moved to the Park- Hurrell’s. Harrisons Bakery used to be where the Phillippos now live (at 1 Church St.) They brought the bread round to the farm and would sell a baker’s dozen of rolls. The building called the Old School was opposite the present surgery (in Church St) and Margaret went to Youth Club there and they did the place up a bit. When Margaret was a child, Lou Northrop sold sweets, odds & ends, etc where Button End starts (6 Button End). In Button End where the firms are on the industrial estate used to be gravel pits and opposite Tony Gatward’s were sandpits. There was a waterworks/pumping Station next to Crows Beech Farm Cottages which produced the first piped water. The blacksmith was Mr Lawrance, next to the school house in High St.
On the other side of the High St, to the left of Ayres Grocers was Miss Jacksons‘s hairdressers, and to the right, Northrop’s Hardware shop. The Post office then was opposite the Coach & Horses, where Coads now live, at 53 High St. The present P.O. (No 28 High St) used to be Ellis butchers. Then it was taken over by Ed Burl. Margaret’s girl friend Benny Banham worked in Burl’s P.O. She used to live in Manor Close. Oddfellow’s Hall was to the right of the present Hairs and Graces hairdressers. In the war it was part of Pyes Radios and most of the women, if their children were of school age, had to work making parts for aeroplanes. 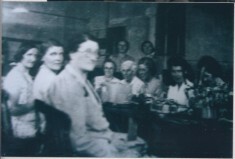 Margaret’s mum worked there, as did Joan Bash (nee Starr)- both to the right on photo. Premier Travel used to be where the car showroom now is (now Ducati bikes). Norman Thompson started it. Andreas’ florist shop was at the top of Chapel Lane. It also sold sweets, crisps, etc. Willers undertakers were next to the present Meadow Way. Manor Close was named after the Manor House which was burnt down in war time when it was a billet for the army. The ‘Pest house’ were built sometime after that on that site. There were searchlights on the field which is now Queen’s close. The children went down New Road to go to school. Weary Will was the Path Sleeper and the paths were always clean. Eli(jah) Northrop, who lived at the top of Green Man Lane, did the sweeping after Will. There were the Queen’s Head, Pemberton Arms, Three Horseshoes, Green Man, Coach & Horses and the Old English Gentleman. When Margaret was young the landlord of the Pemberton Arms was Nicolls, then later his wife. She was very friendly and good to Margaret who often went across there from the farm, and she still keeps in contact with her granddaughters. One found at Button End opposite Hays cottages. One next to houses next to the Village Hall in ditch before P.O. One to left to Village Hall?